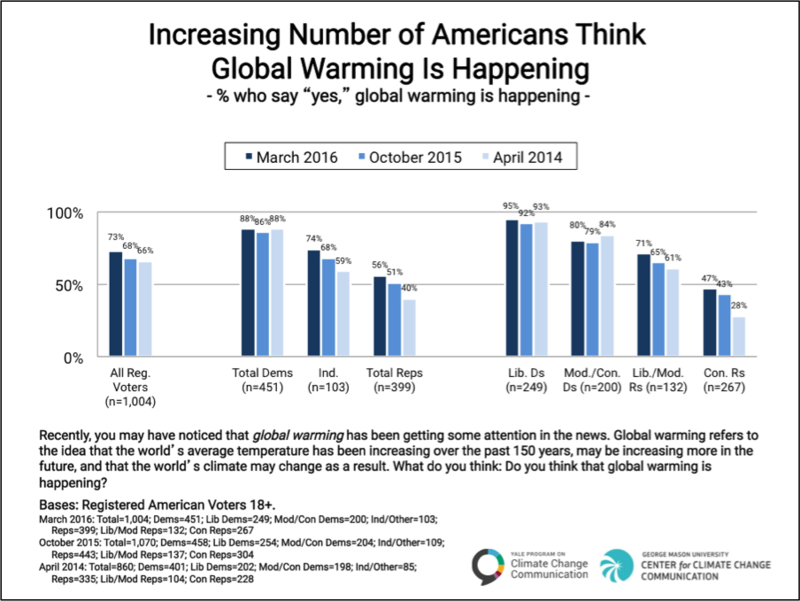 Increasing numbers of American voters think global warming is happening, and many say the issue will influence how they vote in November, according to our most recent national survey conducted last month. Voters who say global warming is happening – now at 73% – have increased 7% since Spring 2014. Nearly all liberal Democrats (95%) think global warming is happening, as do about three in four moderate/conservative Democrats (80%), Independents (74%, up 15 points since Spring 2014) and liberal/moderate Republicans (71%, up 10 points). While only about half of conservative Republicans (47%) think global warming is happening, they have experienced the largest upward shift of any group—an increase of 19 percentage points over the past two years. These findings come from a nationally-representative survey (Climate Change in the American Mind) conducted by the Yale Program on Climate Change Communication and the George Mason University Center for Climate Change Communication. For more information, please see the report on our website. Thank you, as always, for your interest in our work.